Julia Child’s legendary editor, Judith Jones, is cooking for a new companion—her Havanese pup. Here’s why that’s not as crazy as it sounds. 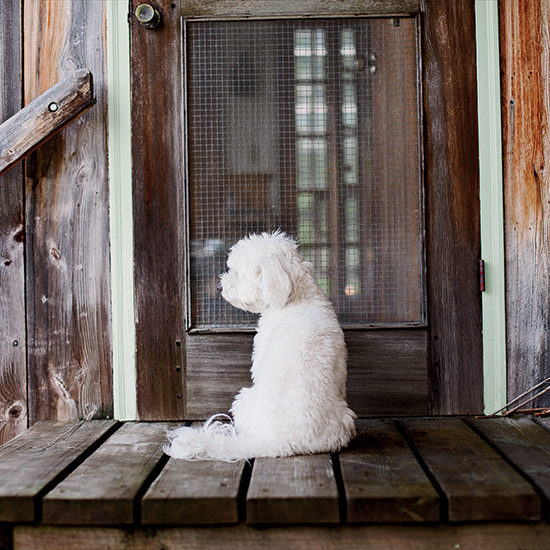 As I sit at Judith Jones's farmhouse table in rural Vermont, it’s hard to say who is most eager for lunch—me or Mabon, the yappy white Havanese pawing at Jones’s leg. My venerable host is braising grass-fed beef shanks, and the aroma of meat and onions rising from her pan is equally enticing to hungry creatures on four legs and two. At 90, and living alone with Mabon, Jones is still an imposing figure—in white slacks with a printed scarf tied around her neck, she is fit and steady from decades of yoga, and direct in a patrician sort of way (“Oh, the BAH-sil from the garden tastes terribly tired, I’m afraid,” she says). A fourth-generation Vermonter who lives half the year in Manhattan, she is the illustrious editor who plucked Anne Frank’s diary from the slush pile and championed its publication. For over half a century at Alfred A. Knopf, she shepherded into print the works of John Updike, Anne Tyler and more than a few revolutionary cookbook authors—Julia Child, Marcella Hazan, James Beard, M.F.K. Fisher. I’m in this legend’s kitchen (with hanging pots and utensils approved by Child herself) to eat dog food. Not the kind in cans or 40-pound bags, but homemade canine cuisine. Jones, author of six previous books, has a new recipe collection called Love Me, Feed Me: Sharing with Your Dog the Everyday Good Food You Cook and Enjoy. Her message is that you should nourish your pet “the way you would a growing child,” with a healthy and safe diet of meat and fish, pasta and grains, and fresh vegetables. As Jones readies a succulent beef shank for Mabon—who detests kale but loves shrimp and grits, and prefers sweet potatoes to white potatoes on his shepherd’s pie—I’m of two minds. Being a new pet parent myself (my wife and son recently talked me into rescuing a Great Pyrenees–border collie mix we named Pi), I understand the impulse to spoil. But I’m not sure about splitting a whole roast branzino or a bowl of soba noodles with my dog, as Jones recommends. Are dogs even supposed to eat soba noodles? Then there are the expectations. Once a puppy gets a yen for roast Cornish game hen, there’s no going back to kibble. Had Jones not stood alone behind Child’s rejected manuscript of Mastering the Art of French Cooking, we might all be eating tuna casserole right now, so perhaps she is right again—risotto with pheasant-back mushrooms and shallots may be the future of doggy dining. It is already edging that way in certain culinary corners: At his Washington, DC, restaurant Art and Soul, chef Art Smith offers a Pooch Patio menu featuring beef tips with rice and a nonalcoholic Bowser Beer. At Boulettes Larder in the San Francisco Ferry Building, chef Amaryll Schwertner sells out of her frozen pet boulettes, snowball-shaped morsels made of wholesome chicken, grains, carrots and sesame seeds. Acclaimed butcher shops around the country, like Fleisher’s in Kingston, New York, offer their own custom blends of meat made specifically for dogs. We clearly want our dogs to love all the same kinds of food we do. “Friends used to make fun of me because I’d be sautéing a piece of veal in olive oil in the morning for Buddy, my West Highland white terrier, and they thought it was ridiculous doting,” says Jill Abramson, the former executive editor of the New York Times and the author of The Puppy Diaries, a memoir about raising a golden retriever. Now that impulse is better understood. “The same trends that have people reading labels and making wiser choices for themselves about diet extend to these beautiful living beings beside us,” Abramson says. By the time lunch is ready on Jones’s farm, Mabon is so exhausted from barking that he’s conked out on the red-tile floor. It’s probably just as well. One of Jones’s commandments is that people and dogs maintain separate mealtimes. “It gives us both space to really savor what we’re eating,” she says, filling my glass with wine. The beef melts off the shank and Jones hands me a lobster pick to “get at all that goodness” of the marrow inside. She’s an excellent dining companion: “I can do an imitation of Julia better than Meryl Streep,” she says at one point, and then proves it. After we’re done, Mabon perks up just in time to receive his portion on a plate in a corner of the kitchen. No utensils are required—the dog laps up every bite, down to the marrow, with his wriggly Havanese tongue. Two weeks later, I am at Whole Foods telling the meat guy I need “enough pork tenderloin for three hungry people and a dog.” It definitely feels weird, and it feels even stranger to spend the better part of a late afternoon slicing and sautéing greens and new potatoes for Jones’s take on a pork-and-leek gratin, a dish I think Pi might like. As I stand over the finished bowl, sprinkling on a layer of fresh bread crumbs and grated Parmesan cheese, I look down at Pi. She looks up at me with a tail wag, as happy as I’ve ever seen, and I think, I would cook for you any night, puppy.